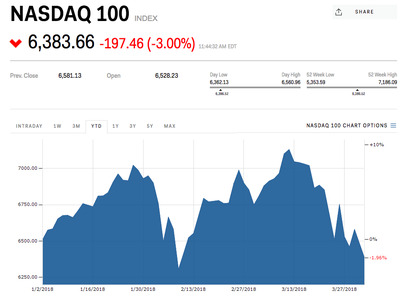 The Nasdaq is now down for the year. The Nasdaq is down 3% Monday. The broader US market is also down Monday. The tech-heavy Nasdaq is now in the red for the year. The Nasdaq is continuing its recent slide Monday, down 3% on the day. The Nasdaq has gotten hit recently, as a massive data breach at Facebook set off selling in the technology sector, and TTrump’s crack-down on Chinese investment into US tech has furthered those losses. The broader US stock market is down Monday, with the Dow Jones down more than 1.5%, the S&P down more than 2%.